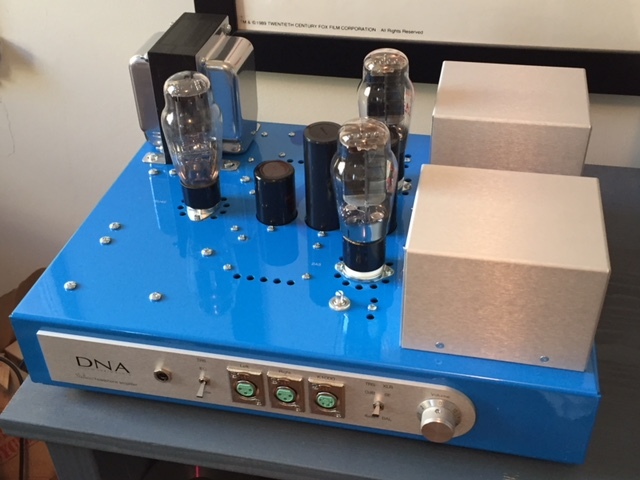 What began as an idea in July 2009 is finally a dream come true: Introducing the Stellaris 2A3 vacuum tube headphone amplifier. The Stellaris features bespoke Audio Note UK output transformers and Duelund CAST capacitors, both regarded as the best in the world, for an unparalleled listening experience. Every component is painstakenly selected by ear for the ultimate in sound quality and synergy working together. The result: Greater clarity, resolution, layering, dynamics, punch, slam, and authority. Hear all of the subtle nuances of an instrument being played and inflections in a singer's voice which makes each performance and recording special. 1 pair balanced XLR and 1 pair unbalanced RCA inputs. The balanced inputs are accommodated through custom Audio Note UK balanced input transformers - the best available. Triodes are naturally low distortion when operated into a high impedance load such as a transformer with proper specifications. They do not require feedback to attain low distortion. • 4-pin XLR output can be used with all headphones - not just the K1000 only. I labeled it "K1000" in honor of the legendary headphone which was the inspiration for developing the Stratus. Dimensions: 8.5 " H x 17" W x 14 " D (21.6cm H x 43.2cm W x 35.6cm D) including tubes and connectors & controls. 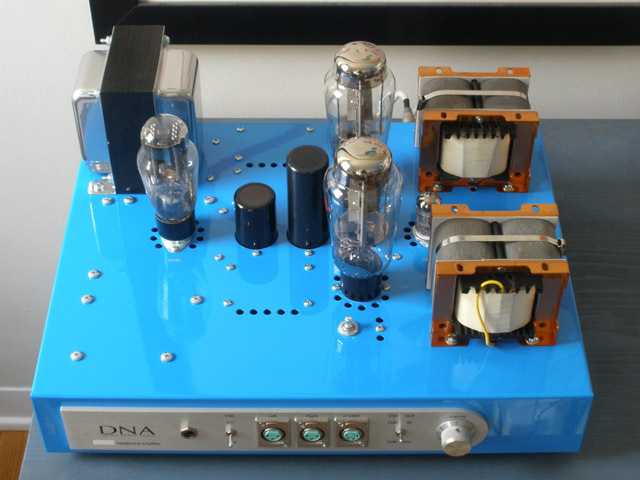 DNA Stellaris headphone amplifiers are proudly made in California from the finest components available. "As a current Stratus owner who loves that amp with the 800s, all I can say is that the Stellaris takes the 800s's to a whole nother level!!!" "The Stellaris, over the Stratus offers much better dynamics, both large (macro) and small (micro). This gives the amp more 'speed' over the Stratus. It is DEAD silent. With the Utopia's I can turn the volume to max and I hear absolutely nothing. There is a large increase in detail over the Stratus. Separation is better and the sound stage seems more deliverate in that the images are more focused and less diffused. The low end is tighter and more solid sounding on the Stellaris. What hasn't changed over the Stratus? The over tonality and texture. The fingerprint of the Stratus is still there. You hear the term 'house sound' thrown around a lot. DNA has a 'house sound' (I suppose) and the Stellaris is right in line with what Stratus owners have grown to love." "Stellaris is my preferred amp for clarity & definition, speed, features, and general 'hi-res' listening. Its the most versatile in that you can swap out the tubes and shift the sound palette without losing the speed and tonality. Make it warmer, lusher, etc. Most of my headphones sound their best of it and I have yet to hear it actively make any of them sound worse." "The first thing that strikes me is how clean the Stellaris sounds. It resolves perfectly every last bit of information in songs where the Stratus can get confused on fast passed stuff with lots and lots of detail. Bass extends lower and is flat from subbass to upped bass. The Stratus is has less sub bass and more mid bass with less control. I never had an instance where the Stellaris didn't have anything but the right amount of bass. Stratus is hit and miss on some songs where the increased mid bass can be good or bad. Tone is bang on the same. Soundstage is wider and deeper with better placement and pin point accuracy. Because of this I've heard subtle instruments on familiar tracks not present in the Stratus. A super faint voice somewhere in the background that I couldn't hear before for example. Same amount of mid/highs balance. Stellaris is faster and never looses composure. The best treble extension I've heard from any amp. You'll never hear more delicate, detailed or lifelike cymbals." "Having owned the Stellaris close to a year now I can say it's above the Stratus in shear musical enjoyment. I've owned a few TOTL amps(GSX-MK2,WA5,Moon 600i,Liquid Glass,Stratus,Apex Teton, Apex Peak etc.) and all of them are a level or two below with the Teton being the closest even against the Stratus. I love my Stellaris and will never part with it." The DNA Stellaris is sold factory direct. Love the sound of silver? Inquire about the Stellaris Special and Silver Stellaris. Copyright © 2001 - 2017 Donald North Audio LLC. All rights reserved.